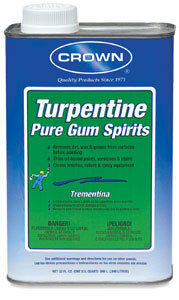 How do you properly store tins of turpentine? In the past where ever I store the container, turpentine smell would inevitably leak out and it's not really a pleasant smell. Initially I had stored it in the corner of my bedroom closet. I quickly moved it to a storage closet built into the stairwell. It's dark and cooler than room temperature usually. I also made the mistake of putting the tin of turpentine inside several plastic bags. This helped with the smell that leaked out but when I took the tin out of the plastic bags, the whole tin was sticky with what I assume is the dried turpentine gas trapped inside the plastic bag. In a general sense it is a very good practice to refer to the material safety data sheets (MSDS) for products like this. The product labels, in theory, should also contain similar information. MSDSs will always contain more information though. They will break down all the information needed about the product when it comes to safety. It should be safe to assume that householdproducts.nlm.nih.gov is a good source of this information. I located the sheet for your specific product. Most other MSDS's for turps cover the exact same sentiment as far as storage and handling is concerned. For completeness sake I have also included some basic handling as well in the information quoted below. Isolate from oxidizers, heat, sparks, electric equipment & open flame. Use only with adequate ventilation. Avoid breathing of vapor or spray mist. Avoid prolonged or repeated contact with skin. Wear OSHA Standard goggles or face shield. Consult Safety Equipment Supplier. Wear gloves, apron & footwear impervious to this material. Wash clothing before reuse. Avoid free fall of liquid. Ground containers when transferring. Do not flame cut, saw, drill, braze, or weld. Empty container very hazardous! Continue all label precautions! Keep separated from strong oxidants, incompatible materials. Keep cool. Keep inside a well-ventilated room. Keep container tightly closed & upright when not in use to prevent leakage. Text is copied as is. Formatting and emphasis is my own. Keep it cool, ventilated and away from sources of oxidants and sources of ignition. Ensure the container is seal and cleaned between uses. I am not sure about the cause of the leaking. Chris Johns has a good theory though. Assuming you follow the instructions above it should not happen. Usually tins like this will be fairly well sealed if you re-close them properly, however there will often be a bit of overspill which collects around the top of the tin from pouring out the contents. With this in mind it will help a lot of you take the time to wipe up any spills from around the tin before you store it and for anything which leaves a dry residue take special care to clean the threads/ sealing surfaces of the lid as any solid residue may impair the seal (an also make it difficult to open again). You also need to bear in mind that anything which contains volatile solvents is a substantial fire risk both because their vapours can catch light very easily and because they can dramatically accelerate any fire which does start near them. So storing them in your bedroom may not be ideal from a safety perspective. If you do have problems with leaked from the supplied containers there are some more robust industrial type containers available for volatile and flammable liquids which you could consider transferring them to, especially if you have no choice but to store them at home. These may also make it easier to dispense them. Store any very vaporise liquid at Cold temperatures. Temperature effects vaporization. For turpentine a freezer is best. I'd advise any one to first switch it to another container of known high quality. Off the shelf products may have been damaged in transit from factory to the shelf. I think glass is better than metal cans. No leaky seams. Only fill about 3/4 full. If food stuff is also stored in the freezer a double layer, inner enclosed in an outer container should be used for the chemical. How can I store my oil pastels? How should I store my nibs for long periods? What can I do to store and segregate my embroidery thread?